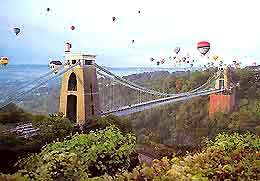 Bristol is renowned as a famous city of culture and offers a superb selection of attractions and festivals throughout the year. Boasting an array of fine architecture, a vibrant harbourside area, an endless selection of restaurants and a range of art galleries, Bristol is home to an acclaimed university and the magnificent Clifton Suspension Bridge, which spans the Avon Gorge. Other highlights in the city of Bristol include many family attractions, numerous shopping malls, multi-screen cinemas, historical theatres and some of the best nightclubs in this part of England.